At least one, but possibly two U.S. citizens with Ebola is due to fly from West Africa to Atlanta during the next few days. Barbara Reynolds spokeswoman for the CDC in Atlanta said that she is not aware of any Ebola patient ever been treated in the United States before. Emory Hospital in Atlanta has issued a statement saying it is well prepared to receive the patients, and that it has the facilities to safely care for them without any risk to the public. Let’s hope and pray they are right. 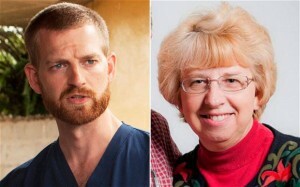 Two Americans are infected, Dr Kent Brantly and Nancy Writebol who are said to be in a grave condition. Apparently a serum has been made from the blood of a child who was cured of Ebola and that serum, although experimental has been offered to Dr Brantly. He is said to have refused the treatment, insisting it be given to Writebol. Dangerous germs, including anthrax, botulism and a strain of bird flu, were improperly sent among government laboratories in five incidents during the last decade, according to the Centers for Disease Control and Prevention, which said it had closed two labs and had imposed a moratorium on shipping deadly pathogens. The announcement of the previously undisclosed incidents comes days after the CDC said scientists had discovered six vials of the smallpox virus in an unused storage room at the National Institutes of Health campus in Bethesda, Md. This of course is not counting the exposure of 86 workers to anthrax in June, and as the article states comes just days after vials of the smallpox virus was found lying at the back of a shelf in a cupboard…. I have great sympathy for those suffering from this awful disease. Up to 90% of those who contract it will die a terrible death, but bringing those people to the United states, UK and Europe will not alter that fact. What it will do is increase the risk of this virus spreading. One mistake with this, and people are going to start dying across the United States. From the point that the Ebola patient leaves the isolation ward in Africa the risks to the rest of the world start to grow. 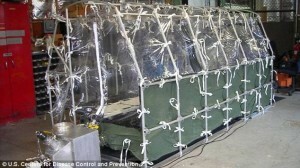 It’s likely the patients will be transferred in pods called aeromedical biocontainment systems. These systems are specifically designed to allow medical staff access without exposing themselves to the virus. They are not particularly sturdy structures as you can see from the photograph. There is not much room on medivac planes, and with possibly two patients to care for it is unlikely there will be enough spare equipment to deal with all possible emergency scenarios. Although bodily waste can be removed from these pods, doing so on the aircraft would be incredibly dangerous. Usually a specialized flow air system, inside a biocontainment air lock would be required to remove level four biological waste safely. From the ambulance or helicopter to the airport. Then they have to get the patient actually onto the plane. A flight of ten hours + depending on where exactly they are taking off from. Transfer from the aircraft on arrival in Atlanta. Travel by ambulance or helicopter to the Emory Hospital. Transfer to the isolation unit. All of this needs to be done, twice if both patients are returned home, without snagging or breeching the flimsy plastic tent of the unit. Now remember, these patients have Ebola Zaire, a condition where ALL bodily secretions are infected. The condition causes diarrhea and vomiting, a high fever causing the patient to sweat, and bleeding from every orifice. These symptoms will not conveniently stop because the patient is in transit to the United states, or Germany, or anywhere else. This entry was posted on August 1, 2014 by Amir Alwani. It was filed under health, news, science, US and was tagged with Ebola.